#BCRPAlert: Due to construction, our Coldstream Recreation Center is closed. It will re-open on Monday 4/22 at 8am and begin operating its programming as normal. For an alternative Spring Break location Cecil Kirk Recreation Center is available. #BCRPAlert: Druid Hill Park Basketball Courts are currently closed for upgrades. Resurfacing, new backboards, etc. The court will reopen in time for our BNBL 50th Anniversary event on May 13th. #BCRPAlert: Due to a maintenance issue, Madison Square Recreation Center is closed. Evening and after-school programming will be moved to Oliver Recreation Center. For up-to-date information, following #BCRPAlerts on social media or call our weather line at 410-396-7022. Things happen! At BCRP, we understand that our recreation centers, parks, special facilities, and events are impacted by many factors, big and small. Our goal is to provide quality programming and experiences, but in the instance, there is a change in scheduling, we have a few ways for you to get the information you need. We’ve introduced #BCRPALERTS, a hashtag that we will use to share important updates about our services and facilities via social media. You can also find updates via social media on Instagram, Twitter, and Facebook @recnparks. Our BCRP ALERTS page is the best place to check regarding closures, delays, and maintenance repairs. Some alerts are based upon inclement weather like snow accumulations, others are the result of service disruptions. For weather-related advisories, call our automated weather hotline 410-396-7022. 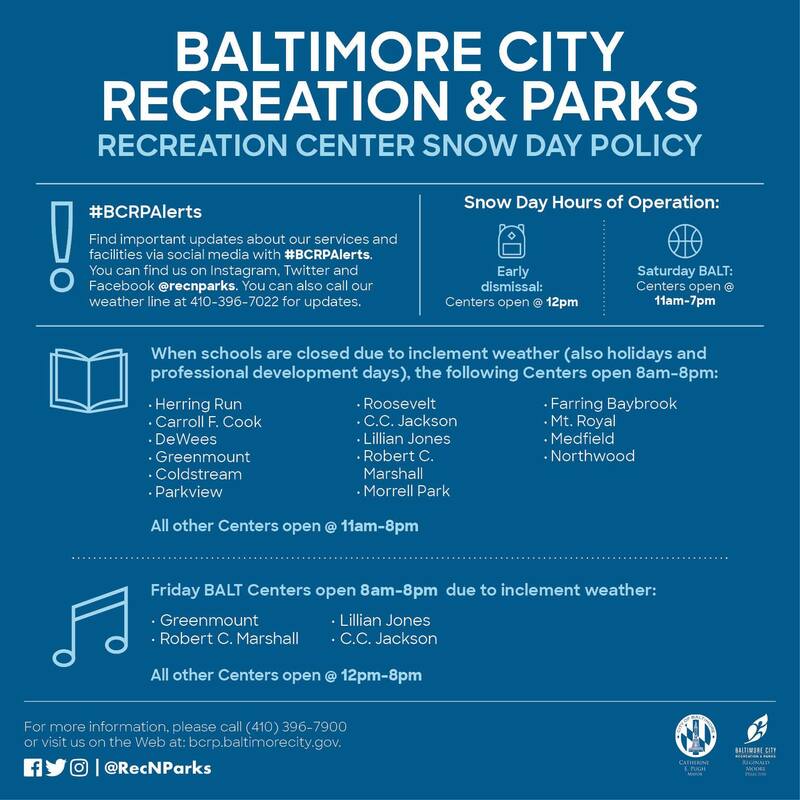 BCRP has a snow day policy specifically for recreation centers. We recognize school closings and early dismissals due to inclement weather conditions are inconvenient. For the most up-to-date information regarding schools, visit the website of Baltimore City Public Schools or check your local TV and radio listings. As a reminder, you can call our weather hotline at 410.396.7022 for rec center closings or view our Facebook page. If you see or are aware of an issue in your community that the City needs to address, please call 3-1-1 to submit a request. If the issue is a matter that BCRP handles, we will be assigned a ticket and will do our best to take care of the issue in a timely fashion. Thanks in advance for your support.